Redesign the active site to bind aflatoxin! This puzzle is much like Round 7 of the Aflatoxin Challenge, but now the aflatoxin molecule is no longer frozen, and can be moved within the active site. Strong constraints will keep aflatoxin from moving too far from its starting position, but we think the extra wiggle room will allow Foldit players to design an active site that binds the molecule more tightly. 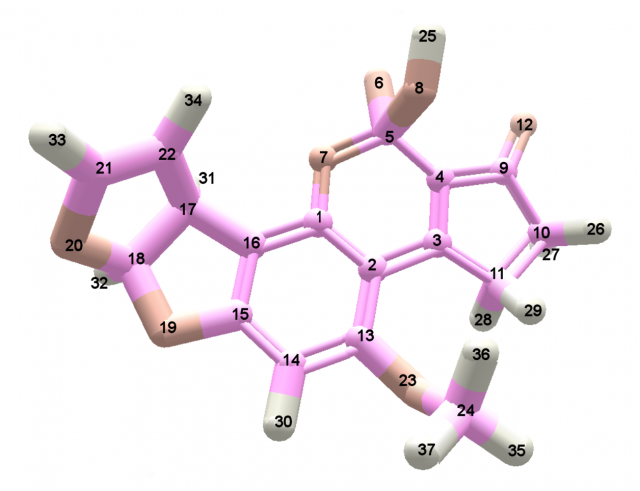 Although no extra residues may be inserted in this puzzle, players may remove residues at positions 62-67, which clash with the aflatoxin molecule. Parts of the scaffold protein have been trimmed to reduce the size of the puzzle, and we've upweighted ligand interactions by a factor of five. 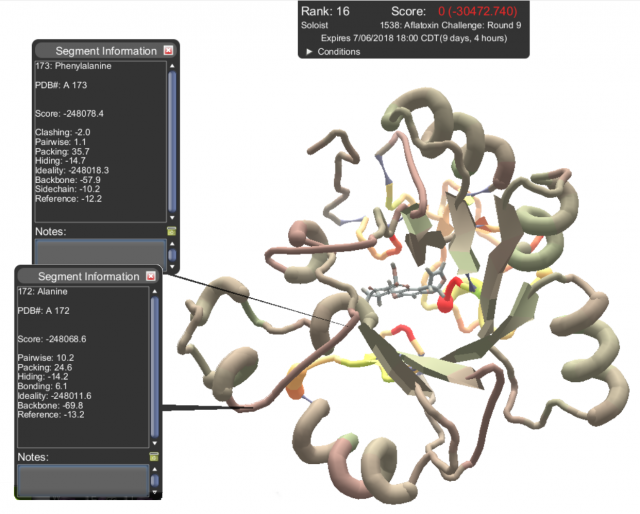 We'd like to see if Foldit players can design proteins that make more interactions with the ligand! See the blog for more details. This is the ninth puzzle of our Aflatoxin Challenge, sponsored by Mars Inc. and Thermo Fisher Scientific. Promising designs will be tested by the Siegel Lab at UC Davis. By participating in the challenge/game, the players agree that all player designs will be available permanently in the public domain, and the players will not seek intellectual property protection over the designs created as part of the challenge/game. The aflatoxin in this round is a little different. The new version doesn't have a calcium, so it's one atom smaller. Also, the atom numbers have changed. Previously, the oxygen at what is now atom 6 (formerly atom 23) was bonded to calcium. The calcium is no longer present. The heavy atoms are 1 to 24, and 25 to 37 are hydrogen. Puzzle 1538 aflatoxin: The calcium atom seen in previous rounds is gone. See the puzzle 1440 comments for the old structure. Thanks to SuperNova185 for spotting the change. The view seen here is Stick + H with EnzDes coloring. Atom Explorer v1.0 was used to enumerate the atoms. The configuration file 0002005425.ir_puzzle.params is in plaintext, and has ATOM records that identify the atoms in order. As the comments mention, the protein has been trimmed way down. There are now several long straight "struts" that connect the different parts. The struts are just a few segments long, and have huge negative scores, mostly based on ideality. For example, segments 13 and 14 each are scoring around -750,000. Scoring has been adjusted to compensate. Puzzle 1538 protein with "struts"